Surf music in "The Key of Cool", modernized for the 21st century! 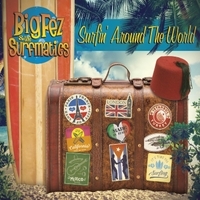 Big Fez and the Surfmatics take classic surf music from the 60's, as well as other genres of the era, and "surfatize" each song to make them their own. Besides classic instrumental songs, Big Fez feature four vocalists who come together to form close harmonies, and memorable singalong tunes you can't resist! The Surfmatics blend excellent musicianship and vocals with a double shot of fun! Dressed in matching suits, dark glasses, and fez, Big Fez and the Surfmatics claim to have first hit the scene in 1960, broke up in 1966, and re-formed to bring the sound of the surf into the 21st century. The band includes Johnny Fez (who claims to be from the “Big Island” and is an indirect descendent of Don Ho…his aunt Heidi was Don Ho's third wife), Donny Fez (former car wash attendant and waxing specialist who hails from the “Long Island”), JB Fez (Marine surfing instructor from “Paris Island”), and Mikey Fez (airplane pilot from “Fantasy Island”). In real life, Johnny Fez is John Haggerty (on 6 and 12 string electric guitar and vocals). John has spent the last 20 years touring all over the US and Ireland in one of America's top Irish rock bands, Hair of the Dog (Billboard Magazine has called them “one of Irish music's biggest sellers”). Donny Fez is really Don Young (on vocals, lead guitar and guit-organ). Don has toured with Country music star Randy Travis, Bluegrass legend Bill Keith, and 50's greats The Coasters and The Drifters. JB Fez is John “JB” Guay (drums and vocals). JB spent the early 80's touring the northeast and Canada with Bad Habit, a classic rock/original music band. JB later played in Oz, a New York- based wedding and party band, and most recently played with classic rock band Hung Jury. Mikey Fez is really Mike McLean (bass). An actor and musician, Mike is a founder member of Irish favorites, The Porters. He is also currently a member of the Americana group The Red Haired Strangers. Mike's acting career includes memorable scenes with Jack Nicholson and Meryl Streep in the movie Ironweed.